Ceramic objects are molded from clay and fired in kilns, which makes them waterproof and resistant. The basic material contains a lot of minerals. Chinese porcelain is typically made from the clay mineral kaolin, silica and feldspars which make the clay flexible and easy to mold in any shape that withstands the firing process. Feldspars are aluminosilicates that contain sodium, potassium or calcium, all of which are fluxing agents that reduce the melting temperatures of the silicates that harden the object. At this stage the earthenware can be refined after vitrification or glazing by firing the vessels at very high temperatures. Pottery, earthenware, sandstone or porcelain have their own techniques that differ from each other. Until the 18th century, the color palette was limited because mankind knew only a few metallic oxides, such as cobalt for blue, copper for green and red, manganese for yellow, iron for brown, yellow and red. In the nineteenth century, colors mixed with chrome gave several shades of red or blue. An engobe or glaze (colored liquid clay) might have replaced an oxide or several oxides, to cover or decorate, mostly in the raw state, all or part of the object. The vessel was shaped on a rotating wheel if it was to be round. The objects were placed in a cold kiln and heated from room temperature to a high temperature, which allowed the silica particles to bond, and reduced the size of the material’s pores to make the vessel smoother. The dough was vitrified and the colors were fixed. This process irredeemably transformed the dough into another material, such as pottery, faience, sandstone or porcelain. Ordinary pottery and sandstone needed only one firing. Earthenware, glazed pottery, porcelain underwent two firings: during the first one, the dough was dehydrated, while the latter one happened once the decoration or the glaze had been applied. Decorated porcelain and low-fired earthenware still underwent several firings to set the scene. 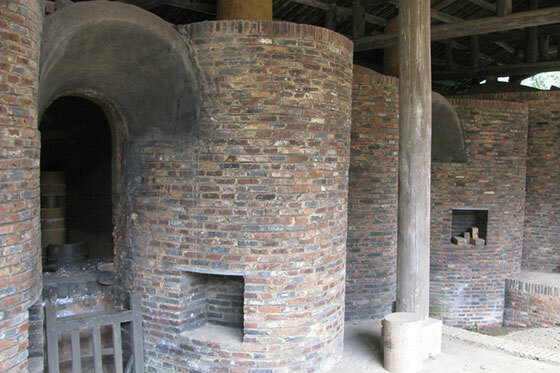 Two main types of kiln were developed, the longyao kilns and the mantouyao kilns. The first ones, called the dragon kilns or tunnel kilns, were used under the Shang-Dynasty in Zhejiang province. Their length may exceed eighty meters. Usually fuelled by wood, they were capable of firing at around 1,200 ° C.
The latter, the horseshoe-shaped mantou kilns, also known as loaf kilns, of the central plains of China, and later on in the north, were used at about the same time. Usually charged with coal, they could reliably produce the temperatures of up to 1,300 ° C, in a reducing atmosphere. Unlike longyao kilns, they were smaller and more compact. If Chinese archaic ceramics was from the Neolithic period, the first proto-porcelain fragments were dated as far back as 1000 BC. 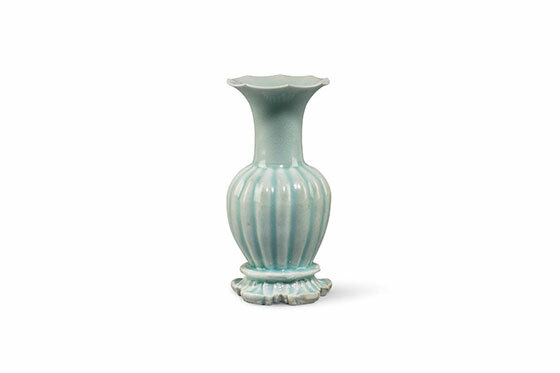 Some experts believe the first “real” porcelain was made in todays’ Zhejiang province, in 200 BC. The manufacturing process remained secret until the 18th century. Père François Xavier d'Entrecolles, a Jesuit missionary and industrial spy who lived and worked in Jingdezhen in the early 18th century, described in detail manufacturing of porcelain in the city. 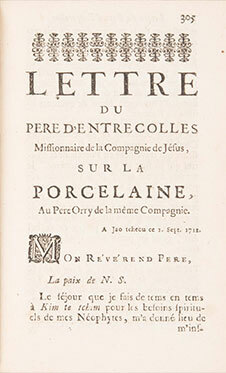 In his letter dated 1712, d'Entrecolles described the way in which pottery stones were crushed, refined and formed into little white bricks, called "baidunzi", before being fired at different stages of temperature. Craftsmen competed with ingenuity and never stopped innovating. The exceptional porcelain production was highly considered in the world, as well as many major sites, which were a national pride for China. The history of Chinese ceramics can not be developed exhaustively, however, here are a few lines to illustrate the best-known Chinese production of the Tang and Song dynasties. Sancai means three-colours, usually green, yellow and a creamy white. It was a type of ceramics which had a glaze of at least three colours. Enamelled wares were often tomb figures for burial use - substitutes for those who had accompanied the deceased during his lifetime – such as the well-known representations of camels, horses, but also servants, dancers or everyday items. They were produced under the Tang, in todays’ Henan Province, bodies and heads were casted in moulds with the parts assembled together using a slip. Jian blackwares, mainly comprising tea wares, were made at kilns located in Jianyang, Fujian province. 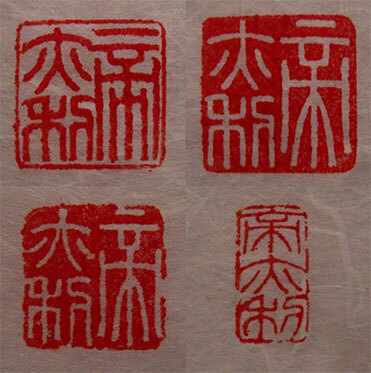 They reached the peak of their popularity during the Song dynasty. The glaze was made using clay similar to that used for forming the body, except fluxed with wood-ash. The bowls were made by thousands, but each was unique. As the base was thicker, it maintained the heat, so that once heated, it cooled very slowly. 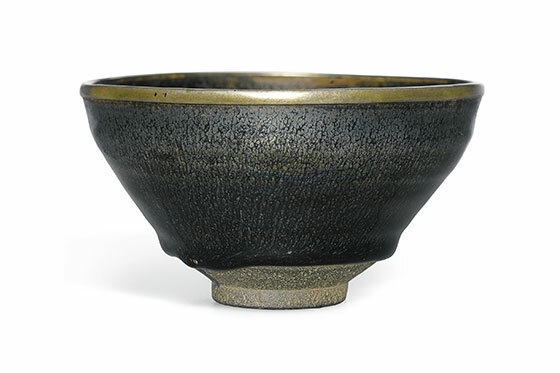 Jian tea wares of the Song dynasty were also greatly appreciated and copied in Japan, where they were known as tenmoku wares. Qingbai wares were made at Jingdezhen and at many other southern kilns from the time of the Northern Song dynasty until the 14th century. 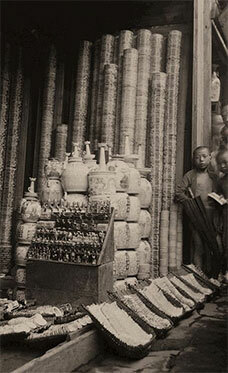 The wares were white, translucent and very resistant, had a greenish-blue colour and some had incised decoration. Most existing wares were bowls which were fired upside down. The rims of such wares were left unglazed but were often bound with bands of silver, copper or lead. One remarkable example of qingbai porcelain is the so-called Fonthill Vase, described in a guide for Fonthill Abbey (Ireland). The vase was made at Jingdezhen, and was sent as a present to Pope Benedict XII by one of the last Yuan emperors of China, in 1338. It was said to be the earliest known specimen of porcelain introduced into Europe. 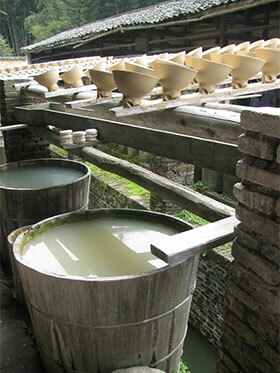 During the Han Dynasty, Jingdezhen was already known for being the most important production centre. 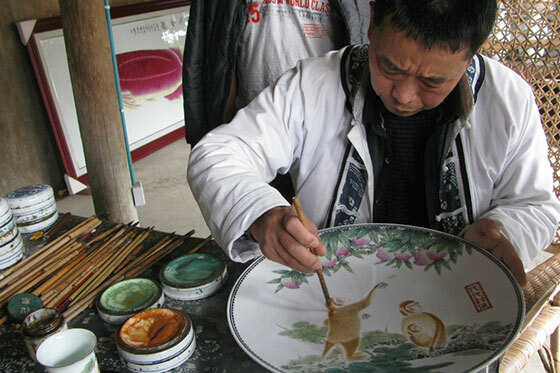 In 1004 CE, under emperor Jingde, it was named as the production centre for Imperial porcelain. As early as the 12th century, “blue and white” porcelain made at Jingdezhen was excellent and probably reached the height of its technical excellence during the Ming-Dynasty (1368–1644). 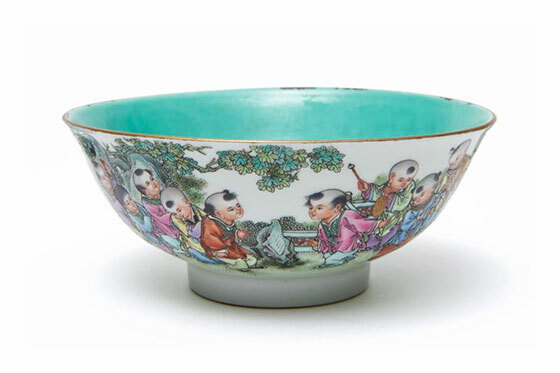 Under the Qing, extremely refined types of porcelain - « famille rose » and « famille verte » - were manufactured, and also being increasingly exported to Europe. Whatever the country or civilization, artists, sculptors, painters or potters have often been inspired by their fathers, or their techniques. Chinese potters did not derogate from it and were even often encouraged by the imperial court. Whilst ceramics with features thus borrowed might sometimes pose problems of identification and dating of an item, they would not generally be regarded as either reproductions or fakes. 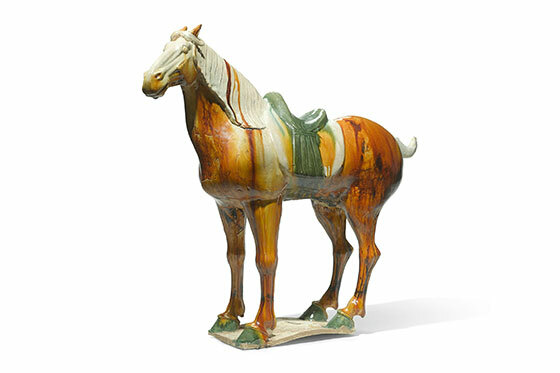 However, fakes and reproductions have also been made at many times during the long history of Chinese ceramics and continue to be made today in ever-increasing numbers. Reproductions of Longquan celadon wares, Tang statuettes, “blue and white" porcelain from the Kangxi period or the East India Company etc. have sometimes abused experts and can still be seen in museums today. The most widely known test is the costly thermoluminescence test, which is used on some types of ceramic to estimate, roughly, the date of last firing. Thermoluminescence dating is carried out on small samples of pottery drilled or cut from the body of a piece, which can be risky and disfiguring. The study of the seals or reign marks might be interesting, although these were often copied and reproduced identically at later times.